Each year, the city of Castellón de la Plana in Spain holds a festival celebrating the founding of the city in honor of the Virgin Mary. A part of the celebration includes the Festival Internacional de Musica, with performances from bands from around the world. This year, Chaminade’s Eagle Regiment was one of those bands. In festival history, there have been only four appearances by a band from the United States. The first full day in Spain was busy for the band. Their first event was an Intersolfa – an informal parade when the circus comes to town. Traffic stopped for the band as it began to march through town to advertize the upcoming musical festivities, and draw people to the park for the Mascletas. At the halfway mark, the band stopped to play for the members at one of the Gaitas, or community social clubs. The regiment then continued to the park, where they played a standstill performance for the attendees. The band became tourists and witnessed the Mascletas, a fireworks competition part of the Magdalena. Fireworks shows are judged on musical concepts like balance, pacing, rhythm, dynamics, etc. After a short rest, the band participated in another parade; this time with a band from Poland. This parade had an audience of more than 1,000 people, and involved throwing colorful confetti. To finish the day, Eagle Regiment participated in Animacion, or the stage show. With bands from Poland, Hungary, and Holland, Chaminade’s band performed a stage show for an audience of more than 3,000 in the town square, Plaça Major. Under the lights and with a national television audience, Eagle Regiment thrilled the crowd with their performance! Friday, the band’s second day in Spain included the International Parade. In addition to the bands which had performed the night before, we were joined by the bands from Ireland, Belgium, Switzerland, and Croatia. While the International Parade was not excessively long in length (just under three miles), it took approximately two hours, and Chaminade students performed like seasoned vets! The crowd of over 30,000 people smiled, clapped, and cheered. The students and teachers also participated in a brief ceremony at City Hall, where Drum Major Kyle Pineda presented gifts to the Mayor. 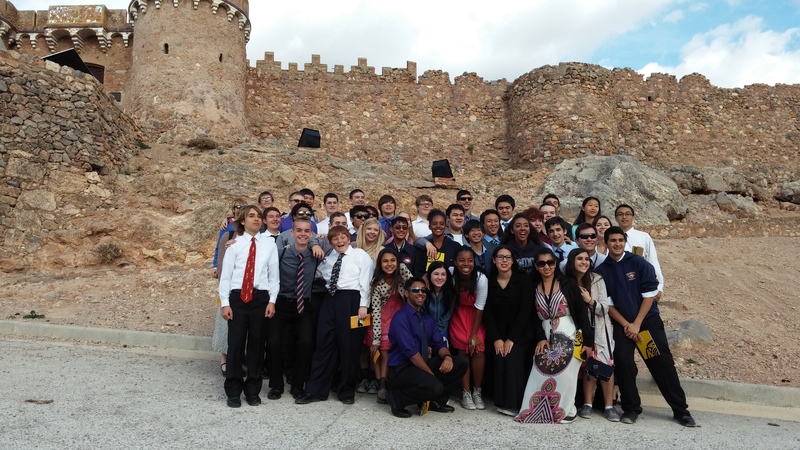 Eagle Regiment traveled to Onda and visited St. Mary’s, a church built in 1240. After their excursion to Onda, they attended Mass on Saturday night. During the march to Plaça Major a Dutch band, Damiate Haarlem, asked Eagle Regiment to march with them. The two groups joined together and held an impromptu parade through the streets with Damiate Haarlem. This final stage performance was in front of an audience of more than 3,000. The Dutch and Polis bands waited for Eagle Regiment to conclude their performance and they all marched back together. A marathon blocked their parade back, so for the next hour, they held had an impromptu concert in the streets, and a crowd of hundreds gathered around to listen. 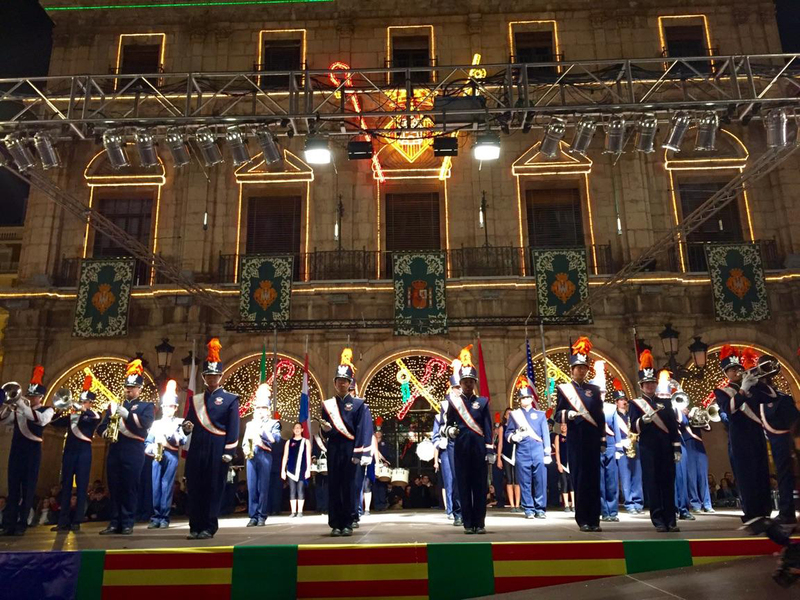 On their last day in Spain, Eagle Regiment was invited to be the final band in a parade that started at 10:00 p.m. The students truly demonstrated all that is asked of them as Marianists, and they have set the standard for many others to follow. This entry was posted in Band, High School, Middle School by Chaminade News. Bookmark the permalink.